In a series of early morning tweets, President Trump announced that he has “reassigned” Sean Spicer, his battle-scarred White House press secretary, and replaced him with Bill O’Reilly, the former Fox News TV host. In other tweets, the President also announced a change in schedule for the White House daily press briefings. Typically, these briefings are held during daytime work hours, but now, with O’Reilly as host, they will be held regularly on weeknights at 8 PM ET. 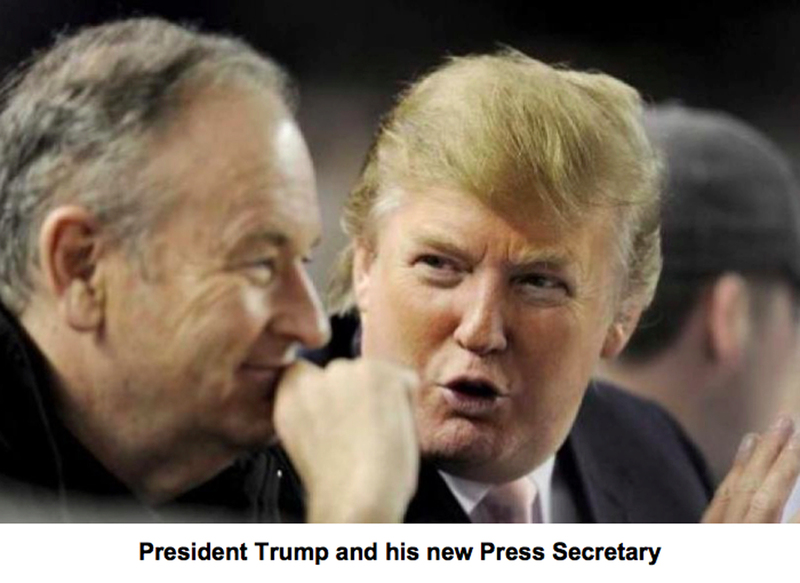 The President’s announcement came the day after O’Reilly was ousted from Fox News following numerous allegations of sexual harassment that prompted the network to end his program, a fact Trump’s tweets did not acknowledge. Sean Spicer has not been seen or heard from since his ouster, but according to one usually reliable White House source, the President has reassigned Spicer to the staff of the US Holocaust Museum where he will help handle public relations. SO FUNNY!!! WAS IN THE DENTIST CHAIR AND HE CRACKED UP WHEN I RELATED IT TO HIM. That’s odd. I thought I saw Spicer just a couple of days ago outside the Russian Press Office. Musta been somebody else…..